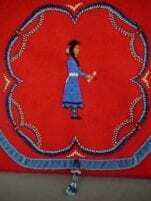 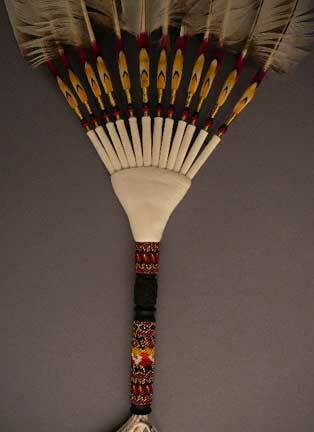 Monty Claw is a Navajo artist who practices in the Native American Church and creates exquisite peyote fans. 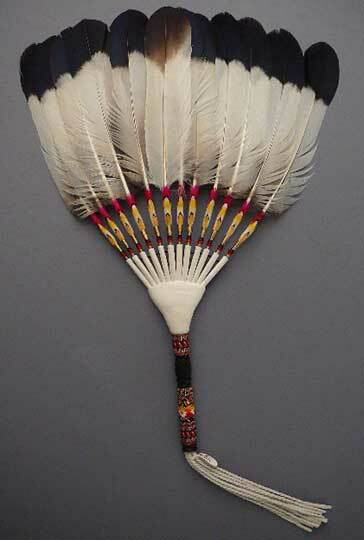 This is a 12 feather flat loose fan with blue-eared pheasant wing feathers, Lady Amherst feathers, dyed floral feathers, # 13 cut beads, deer skin, wood dowels, nylon thread, brass ferrule connector, carved ebony. 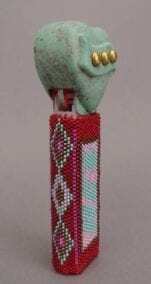 Navajo silversmith Moogie Smith creates jewelry with deep inlay. 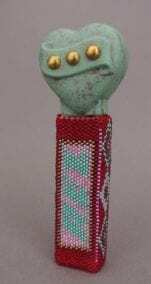 This ring is inlaid with natural materials: coral of a beautiful red as well as turquoise. 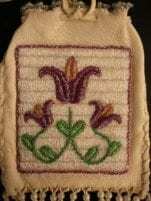 Size 11 1/2; 11/16" at widest, tapering to 1/4". 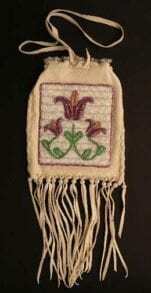 A deerskin purse with applique of floral beaded design by Karen Francis. 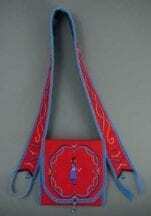 Purse is 8" x 6 1/2": 25" including strap and fringe.